"Rising Star" Lee Min-ho has been chosen to model for Hyundai's new 'Veloster' in China and will start active promotional activities. Lee Min-ho signed a contract with the Hyundai 'Veloster' in China, which was his sponsored car in the SBS drama "City Hunter". 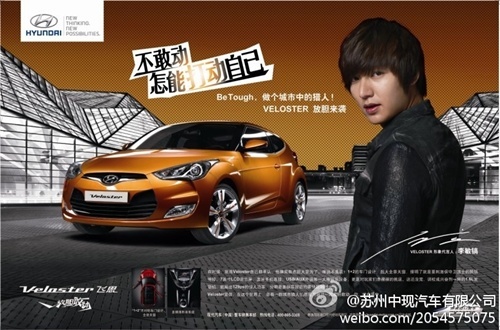 Therefore, he will attend the 'Presentation of the Veloster and Fan Meeting' in Beijing on September 26th. Chinese media say, "Fans are excited about Lee Min-ho's visit to China. We are experiencing the highest number of competitors ever to attend an event like this". The ratio of applicants to attendees is an incredible 1000:1. In fact, his popularity in China is unbelievable. News of his visit to China was posted on Twitter and recorded the 'highest number of re-tweets'. He ranked number 1 for three months in row for most popular actor in a Chinese portal site. The act of becoming a 'City Hunter wannabe' now ranges from people of all ages from their teens upwards, and even Chinese celebrities. Lee Min-ho's officials say, "After the drama "City Hunter" he has been chosen and signed for Lotte Chilsung's Cantata, furniture brand Jang In Furniture, men's brand Trugen and outdoor brand Eider. We have advertisement meetings planned in China so we will meet various people there before our return". "Lee Min-ho chosen to model for Hyundai 'Veloster' in China"
Upcoming Korean drama "Me Too, Flower!" [MD Photos] Han Hyo-joo "Smiles and bangs"